The map of Cairo as it appears in Mario is Missing! Cairo (Arabic: القاهرة, Al-Qāhira) is the capital city of Egypt and the largest city in Africa. Along with New York City, Rio de Janeiro, Tokyo, and London, it is in the last set of cities Luigi has to visit in the game Mario is Missing! 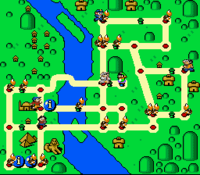 As with all the other cities in the game, Cairo was invaded by Koopa Troopas sent by Bowser. The Troopas stole artifacts from various landmarks of the city: the Great Pyramid, the Mosque of Mohammed Ali, and the Sphinx. Luigi's task is to find all the artifacts and return them to their respective landmarks. Also, tie-seller Ali Mustafa, appearing in the Club Nintendo comic "Mario's Picross", is from Cairo. "You're in 1,025,000 square kilometers of desert! But don't desert us yet." "It's the largest city in Africa. Care to hear the riddle of the sphinx?" "From Saudi Arabia we entered Egypt by the southeast border. Dancing camels were our trusty porters." "I saw a sign near the Sinai that read welcome to Masr. It was written in Arabic." "Cairo sits on the split of the Nile. From here the river goes south for 1500 kilometers." "You're between two continents that begin and end with the letter a." "Inventors of mummies, papyrus and heiro--your mommy would love a postcard from here in Cairo!" "You're in Ramses Square, Cairo, Egypt, Africa!" This page was last edited on March 29, 2018, at 13:18.